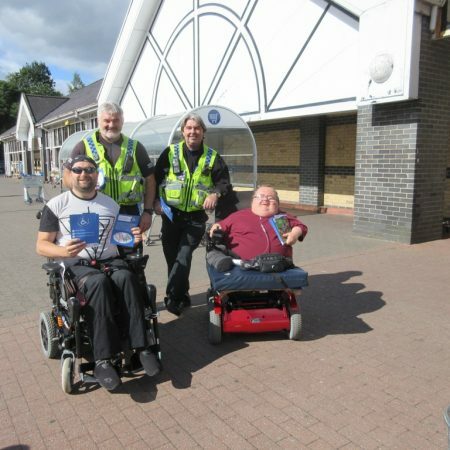 On Monday our Considerate Parking team were out talking to those who were shopping in Tesco Aberdare about our campaign. The team included our volunteers, officers from South Wales Police Cynon Divisionand (@SWPCynon ) and members of Rhondda Cynon Taff Disability Forum. We chatted with parents who had small children and babies who had experienced problems using pavements because of inconsiderate parking; we also heard stories from the elderly who regularly struggle to access their cars because of people parking inconsiderately. 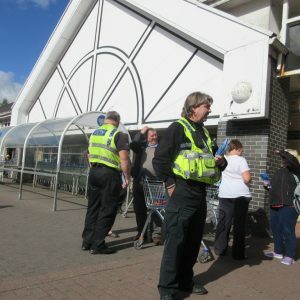 While out and about members of the team were encouraged by the positive support received from those shopping in Tesco. We also got to visit The Cynon Valley Museum and McDonalds Aberdare who were happy to take our flyers. Join us on Friday 14th September in Asda at 10am to share your stories with us and find out more about our campaign.